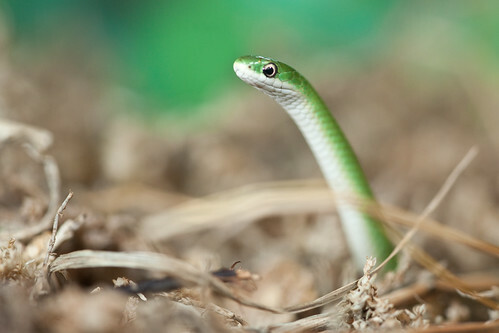 These small, bright green snakes (with whitish bellies) camouflage well into their grassy habitats. As their name implies, these snakes are smooth to the touch and can grow to 2 feet long, though immature individuals are much smaller. Lacking venom, these snakes are harmless to humans or larger animals that share the habitat with them. Smooth green snakes are found from northern Canada down to the southern United States and even into northern Mexico. There are some populations in the western United States, including Wyoming and New Mexico. This species is declining due to habitat destruction and pesticide use. Some populations have been completely eradicated. 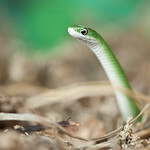 Smooth green snakes occupy a wide range of habitats, though they depend on moist, grassy areas in prairies, marshes or near lakes. They will occupy forests if conditions are right. While they spend most of their time on the ground, they will hide in small bushes or slither beneath rocks or logs. 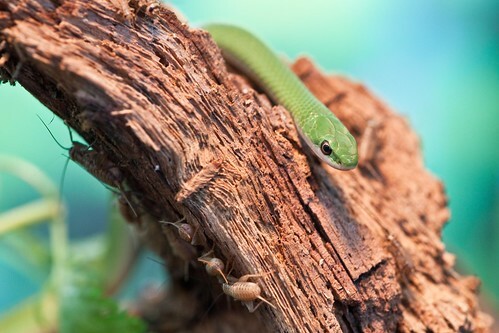 The bulk of smooth green snakes’ diet is insects—crickets, grasshoppers, caterpillars, spiders and beetles. These small snakes are preyed upon by birds of prey, small mammals and other snakes. These solitary snakes are active in warmer months, they hibernate in groups (including other snake species) during the winter, using anthills or rodent burrows as temporary homes. 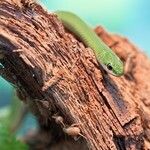 Though diurnal (active during the day), smooth green snakes can be found in the evenings during warmer months. These snake breed annually, resulting in eggs being laid in the early summer and hatching a few months later. As many as a dozen eggs will be laid at once, deposited in shallow burrows or under rocks or logs. (Females can retain the eggs in their bodies, keeping them warm and safe from predators.) Once the eggs are laid, the female offers no more parental care. Lacking venom, smooth green snakes capture prey with quick strikes. 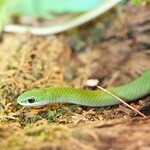 An ectothermic (cold-blooded) species, smooth green snakes rely on smell, vision and ground vibrations to locate prey. They communicate with one another using chemical and tactile clues. 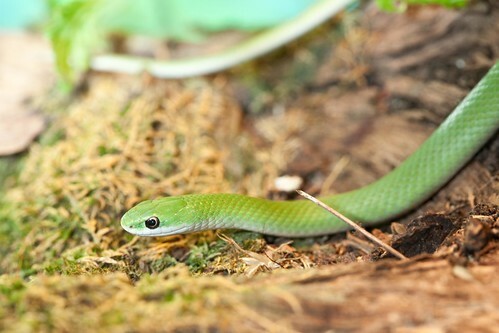 When attacked by a predator, smooth green snakes can emit a foul-smelling fluid.